Where can I stream the tournament? The entire competition will be streamed with a stellar line-up of presenters and casters. 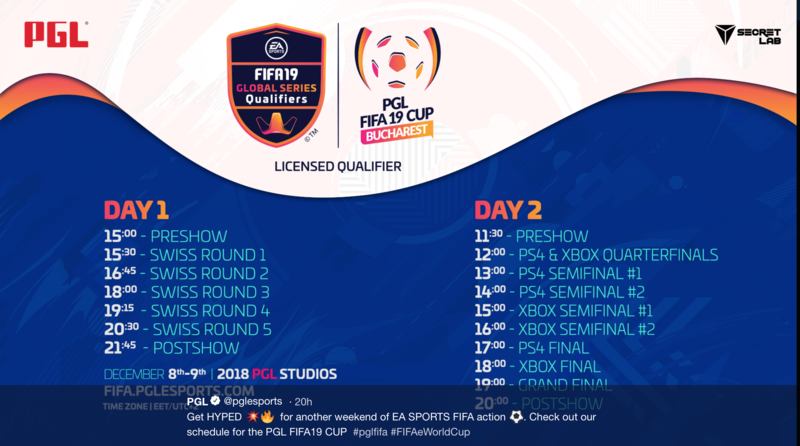 Be sure to visit the official site of the PGL FIFA 19 Cup on the day of the event, along with the PGL eSports Youtube channel. Can I follow the tournament on Twitter? Updates will be provided on the PGL eSports official Twitter page. Also be sure to search the hashtags #FIFAeWorldCup and #pglfifa as well as looking up PGL FIFA 19 Cup Bucharest in the Twitter search bar. Don’t forget to follow your favourite players competing in the tournament, along with their respective clubs/organisations who are likely to provide real time updates on their progress. 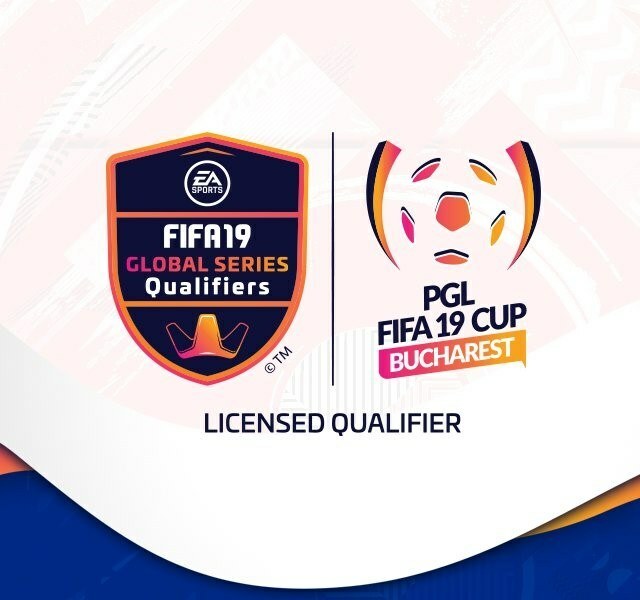 The PGL FIFA 19 Cup in Bucharest this weekend will be the second LQE of the season so far. The Romanian city will host its second FIFA tournament in two weeks as 32 of the very best players on the circuit will be facing off against each other. The first player in the spotlight is the 2018 FIFA eWorld Cup winner Mosaad “Msdossary” Aldossary of Rogue eSports. The reigning world champion will be making his first appearance in Bucharest after not appearing at the FUT Champions Cup the previous weekend. He will be competing on the Xbox One, which boasts a stellar line-up of former and current champions. One such current champion is British player Donovan “F2Tekkz” Hunt. The teenage sensation proved that lightning can strike twice in FIFA after winning the first FUT Champions Cup of the season for the second year running! What Hunt did in Barcelona last January, he repeated in Bucharest last weekend. Following the win, many players within the scene have stated that he is the one to beat this season. However, the F2 player failed to win another major competition following last season’s FUT Champions Cup win and he’ll be desperate to back up his success this season. One player who did not enjoy last weekend’s FUT Champions Cup was Spencer “Gorilla” Ealing. The 2017 FIFA eWorld Cup (FIWC) champion was eliminated in the Swiss style group stages, but we are still big fans of “Gorilla” and are expecting a reaction from him this weekend as he looks to change up his game and get back amongst the contenders to win the tournament. Got 4 days to change things up in my team and formation. Next tournament is Saturday where my aim is to win. Disappointing result last weekend but we go again! Also lining up this weekend is a hugely dangerous German player who reigned supreme in the Global Series Xbox One Playoffs last season and finished top 8 in the 2018 FIFA eWorld Cup finals in London. Michael “MegaBit” Bittner competed at the first FUT Champions Cup of the season and started strongly, winning four of his five group stage matches, losing only to the eventual winner “F2Tekkz”. He was narrowly beaten in the last 16 by Dani "Dani" Hagebeuk, whom Bittner had already faced (and defeated) the previous day. If the Werder Bremen man can improve his consistency this weekend, then he has the potential to go all the way. The final player featured on our preview plies his trade on the PS4. It’s the 2018 FIFA eWorld Cup runner-up Stefano "StefanoPinna" Pinna. The Belgian eDevil and PSV Eindhoven player has been performing very strongly online and has also been busy in offline competition, representing PSV in the eDivisie. With “Msdossary” playing on the Xbox One, Pinna has to be seen as the best PS4 player in the world today following his incredible run to the Grand Final at the 02 Arena in August. He will face stiff competition in “nicolas99fc” on the PS4, but his offline pedigree will give him the belief he needs to carry on his eDivisie form and perhaps go one step further this weekend than he did in the eWorld Cup Grand Final. 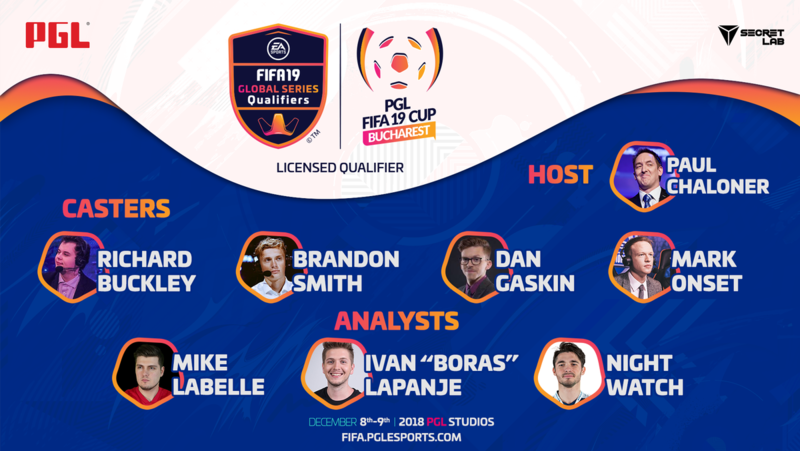 The cash prize may not be as lucrative as the FUT Champions Cup last weekend, but the PGL FIFA 19 Cup still offers a healthy amount of Global Series Points to claim, meaning for the players involved, this LQE is a competition they will all be desperate to win. “F2Tekkz” will come into the competition as the clear favourite to make it a Bucharest double trophy triumph, and rightly so considering his recent performances. It would be brave to bet against him right now and we wouldn’t want to be the ones to do it.